With the beginning of a brand new month, SAMVAD brings to you its new issue, theme being the Telecom Sector. The thought most certainly sends a chill down our spines. This shows how deeply rooted telecom is in our daily lives. Hence, we, SAMVAD have dedicated this month’s issue to what forms one of the most important part of our lives today. In the interview section, we have with us Mr Rajiv Mitra who is a senior telecom leader and mentor and has been associated with Etisalat. He speaks about his view on the future of the Telecom Sector on India, the challenges that the Indian Telecom Sector grapples with and how the CDMA technology has lost its relevance in today’s world, how 4G will change the world and on some more insights. Ever wondered why Nokia went ahead with Windows and not Android? Find out some interesting facts on the Nokia-Microsoft deal and the impact that it shall have on them in our Featured Article. With the ever changing and competitive telecom industry, the telecom companies today are venturing into more and more alliances for them to get a strong hold on the market. However, one can most certainly learn from them for they will play a huge role in what would define the sector in the future. Find out more in the article in the Marketing section. The telecom industry has come a long way. There have been various forces responsible to shape it to what it is today. However, this is not the end. There are many things yet to come like Green telecommunication, the companies’ focus shifting from urban to rural etc. Do read our article in the General Management section for more details. 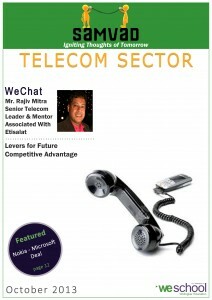 Click here to access the July 2013 issue on “Telecom Sector”. Keep reading and do write for us. Do write in with your feedback and comments to samvad.we@gmail.com.